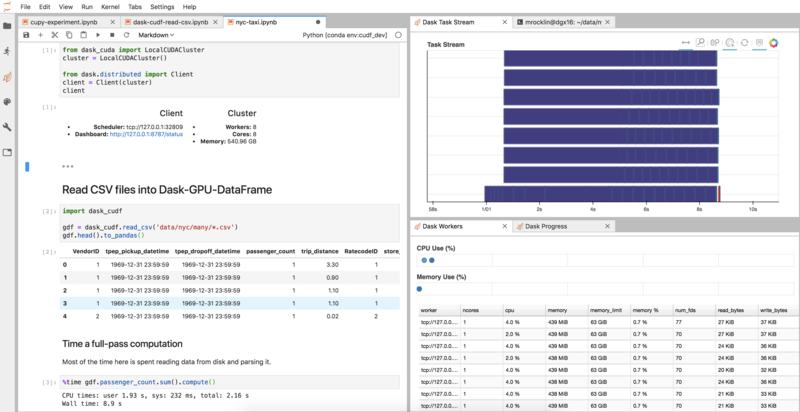 We’re building a distributed GPU Pandas dataframe out of cuDF and Dask Dataframe. This effort is young. This post describes the current situation, our general approach, and gives examples of what does and doesn’t work today. We end with some notes on scaling performance. You can also view the experiment in this post as a notebook. The cuDF library aims to implement the Pandas API on the GPU. It gets good speedups on standard operations like reading CSV files, filtering and aggregating columns, joins, and so on. cuDF is part of the growing RAPIDS initiative. The Dask Dataframe library provides parallel algorithms around the Pandas API. It composes large operations like distributed groupbys or distributed joins from a task graph of many smaller single-node groupbys or joins accordingly (and many other operations). The Dask distributed task scheduler provides general-purpose parallel execution given complex task graphs. It’s good for adding multi-node computing into an existing codebase. Given these building blocks, our approach is to make the cuDF API close enough to Pandas that we can reuse the Dask Dataframe algorithms. We get to reuse the parallel algorithms found in Dask Dataframe originally designed for Pandas. It consolidates the development effort within a single codebase so that future effort spent on CPU Dataframes benefits GPU Dataframes and vice versa. Maintenance costs are shared. By building code that works equally with two DataFrame implementations (CPU and GPU) we establish conventions and protocols that will make it easier for other projects to do the same, either with these two Pandas-like libraries, or with future Pandas-like libraries. This approach also aims to demonstrate that the ecosystem should support Pandas-like libraries, rather than just Pandas. For example, if (when?) the Arrow library develops a computational system then we’ll be in a better place to roll that in as well. When doing any refactor we tend to clean up existing code. For example, to make dask dataframe ready for a new GPU Parquet reader we end up refactoring and simplifying our Parquet I/O logic. cuDF has some pressure on it to repeat what some believe to be mistakes in the Pandas API. For example, cuDF today supports missing values arguably more sensibly than Pandas. Should cuDF have to revert to the old way of doing things just to match Pandas semantics? Dask Dataframe will probably need to be more flexible in order to handle evolution and small differences in semantics. We could also write a new dask-dataframe-style project around cuDF that deviates from the Pandas/Dask Dataframe API. Until recently this has actually been the approach, and the dask-cudf project did exactly this. This was probably a good choice early on to get started and prototype things. The project was able to implement a wide range of functionality including groupby-aggregations, joins, and so on using dask delayed. We’re redoing this now on top of dask dataframe though, which means that we’re losing some functionality that dask-cudf already had, but hopefully the functionality that we add now will be more stable and established on a firmer base. Today very little works, but what does is decently smooth. Here is a simple example that reads some data from many CSV files, picks out a column, and does some aggregations. All of the infrastructure surrounding the cuDF code, like the cluster setup, diagnostics, JupyterLab environment, and so on, came for free, like any other new Dask project. Our df object is actually just a normal Dask Dataframe. We didn’t have to write new __repr__, __add__, or .sum() implementations, and probably many functions we didn’t think about work well today (though also many don’t). We don’t have to write anything special like a separate .to_dask_dataframe method or handle other special cases. Dask parallelism is orthogonal to the choice of CPU or GPU. It’s easy to switch hardware. By avoiding separate dask-cudf code paths it’s easier to add cuDF to an existing Dask+Pandas codebase to run on GPUs, or to remove cuDF and use Pandas if we want our code to be runnable without GPUs. There are more examples of this in the scaling section below. In general the answer is many small things. Many operations that used to work in dask-cudf like groupby-aggregations and joins no longer work. We’re going to need to slightly modify many cuDF APIs over the next couple of months to more closely match their Pandas equivalents. We had to make Dask Dataframe a bit more flexible and assume less about its constituent dataframes being exactly Pandas dataframes. (see dask/dask #4359 and dask/dask #4375 for examples). I suspect that there will by many more small changes like these necessary in the future. These problems are representative of dozens more similar issues. They are all fixable and indeed, many are actively being fixed today by the good folks working on RAPIDS. The RAPIDS group is currently busy working to release 0.5, which includes some of the fixes necessary to run the example above, and also many unrelated stability improvements. This will probably keep them busy for a week or two during which I don’t expect to see much Dask + cuDF work going on other than planning. After that, Dask parallelism support will be a top priority, so I look forward to seeing some rapid progress here. In my last post about combining Dask Array with CuPy, a GPU-accelerated Numpy, we saw impressive speedups from using many GPUs on a simple problem that manipulated some simple random data. That exercise was easy to scale because it was almost entirely bound by the computation of creating random data. We did a similar study on the read_csv example above, which is bound mostly by reading CSV data from disk and then parsing it. You can see a notebook available here. We have similar (though less impressive) numbers to present. First, I want to emphasize again that it’s easy to test a wide variety of architectures using this setup because of the Pandas API compatibility between all of the different projects. We’re seeing a wide range of performance (40x span) across a variety of different hardware with a wide range of cost points. Second, note that this problem scales less well than our previous example with CuPy, both on CPU and GPU. I suspect that this is because this example is also bound by I/O and not just number-crunching. While the jump from single-CPU to single-GPU is large, the jump from single-CPU to many-CPU or single-GPU to many-GPU is not as large as we would have liked. For GPUs for example we got around a 2x speedup when we added 8x as many GPUs. Instead, it’s likely that we’re just not treating our disks and IO pipelines carefully. We might consider working to think more carefully about data locality within a single machine. Alternatively, we might just choose to use a smaller machine, or many smaller machines. My team has been asking me to start playing with some cheaper systems than a DGX, I may experiment with those soon. It may be that for data-loading and pre-processing workloads the previous wisdom of “pack as much computation as you can into a single box” no longer holds (without us doing more work that is).